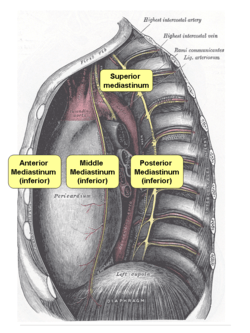 The mediastinum (from Medieval Latin mediastinus, "midway") is the central compartment of the thoracic cavity surrounded by loose connective tissue, as an undelineated region that contains a group of structures within the thorax. The mediastinum contains the heart and its vessels, the esophagus, trachea, phrenic and cardiac nerves, the thoracic duct, thymus and lymph nodes of the central chest. 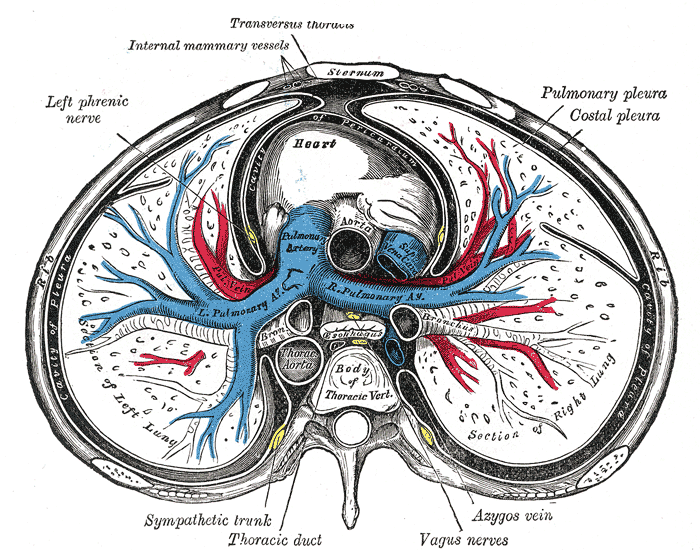 The mediastinum lies within the thorax and is enclosed on the right and left by pleurae. It is surrounded by the chest wall in front, the lungs to the sides and the spine at the back. It extends from the sternum in front to the vertebral column behind, and contains all the organs of the thorax except the lungs. It is continuous with the loose connective tissue of the neck. The superior mediastinum starts at the superior thoracic aperture and ends at the thoracic plane. The thoracic plane separates the superior and inferior mediastinum. It is a plane at the level of the sternal angle , and the intervertebral disc of T4–T5. The inferior mediastinum from this level to the diaphragm. This lower part is subdivided into three regions, all relative to the pericardium - the anterior mediastinum being in front of the pericardium, the middle mediastinum contains the pericardium and its contents, and the posterior mediastinum being behind the pericardium. Anatomists, surgeons, and clinical radiologists compartmentalize the mediastinum differently. For instance, in the radiological scheme of Felson, there are only three compartments (anterior, middle, and posterior), and the heart is part of the anterior mediastinum. posteriorly by the first four thoracic vertebral bodies. The thoracic plane separates the superior and inferior mediastinum. It is a plane at the level of the sternal angle, and the intervertebral disc of T4–T5. anteriorly by the sternum, the left transversus thoracis and the fifth, sixth, and seventh left costal cartilages. Bounded: pericardial sac – It contains the vital organs and is classified into the serous and fibrous pericardium. 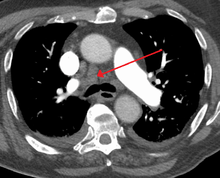 laterally by the mediastinal pleura (on either side). Anterior mediastinum: substernal thyroid goiters, lymphoma, thymoma, and teratoma. Posterior mediastinum: Neurogenic tumors, either from the nerve sheath (mostly benign) or elsewhere (mostly malignant). There are many diseases that can present with a widened mediastinum (usually found via a chest x-ray). The most common ones are aortic unfolding, traumatic aortic rupture, thoracic aortic aneurysm, and traumatic thoracic vertebral fracture. A widened mediastinum is a classic but rare hallmark sign of anthrax infection. ↑ Goodman, Lawrence. Felson's Principles of Chest Roentgenology. 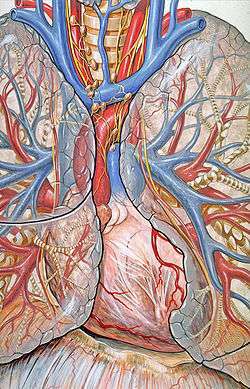 Look up mediastinum in Wiktionary, the free dictionary. Anatomy figure: 21:01-03 at Human Anatomy Online, SUNY Downstate Medical Center – "Divisions of the mediastinum." Anatomy figure: 21:02-03 at Human Anatomy Online, SUNY Downstate Medical Center – "The anatomical divisions of the inferior mediastinum." thoraxlesson3 at The Anatomy Lesson by Wesley Norman (Georgetown University) – "Subdivisions of the Thoracic Cavity"